I would like to take this opportunity to thank all my friends and visitors new and old, for their support over the years, and for the many Birthday greetings received over the last few days. Please feel free to download this little effort, trace off, add your own colour / decoration and use as you would like. You might like to know, H2 Pencil traced onto A4 card-stock from the original, which was roughly drawn with double pencil: x height 1″. Gap between lines: 1/2″ . I was about to add a Celtic border, but then thought, why should I do all the work? So, over to you. Enjoy! A couple of tips. Remember to use the whole arm from the shoulder, and have another sheet of paper under your writing hand. This will stop your hand from sticking and smudging, and help you to slide round the curves and down the whole length of the ascenders / descenders. As usual, after publication, I see a number of things that could be improved. Nothing new in that! One is never satisfied. If you do trace this off though, it might be a good idea just to drop the writing lines by about 1/4″ or 3/8″ to help balance the whole page. 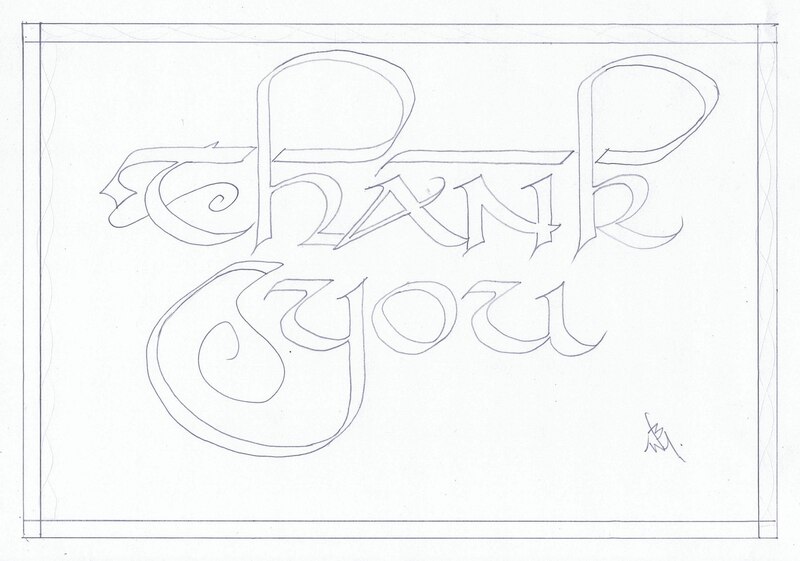 This entry was posted in CALLIGRAPHY,CALLIGRAFFITI,LETTERING,HOW TO and tagged calligraphy, lettering, Thank you, uncial. Bookmark the permalink.